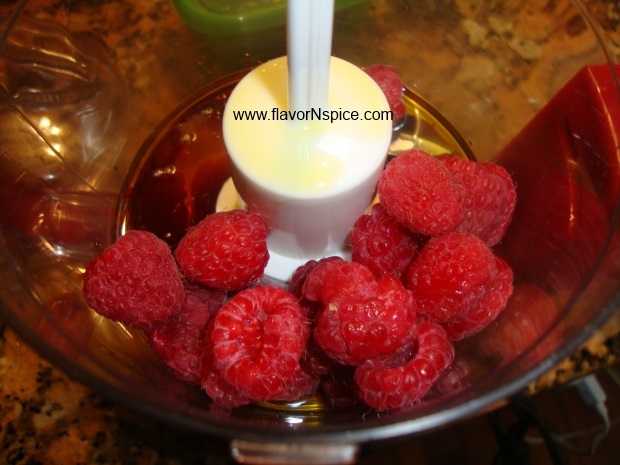 It’s been quite a while since I have posted a new recipe. Somehow life has been busier than normal – for one I have been working hard trying to resurrect my backyard after this supremely harsh winter (I have lost quite a few trees and other perennials and the worst of them has been the loss of a fig tree). Then, my husband came back after a month long work-related trip in Indonesia, we had old friends visiting from out of town, my daughter came back from college, my son is due back in a couple more days and of course the usual ho-hum surrounding my three dogs always takes up a lot of my time! It’s not that I haven’t been cooking (of course, I am ALWAYS cooking) it’s just that I haven’t been able to take pictures and write up the recipes. So the blog has suffered a bit of neglect. Anyway, my regular readers may already know that in order to lose some weight and eat a bit healthier, I have been cutting back on simple carbs and sugar quite a bit. 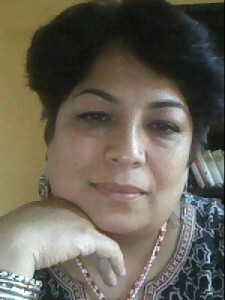 It is amazing how much this change has helped increase my energy level. Of course, I am not going all Atkins on anyone – I am just cutting back on unhealthy carbs and sugar. I have always included a healthy portion of vegetables in my diet (and consequently my family’s too) but now I am leaning a bit more towards vegetables. At least once a day, I eat a meal that is largely made up of a warm or a cold vegetable salad. Occasionally I also add some cheese (especially goat cheese) or some left-over grilled meats to the salad (sorry Bill Clinton, somehow I just can’t seem to go all vegan – I just love cheese a bit too much!). My lunch today consisted of a roasted Brussels Sprout salad that could be served warm or cold. 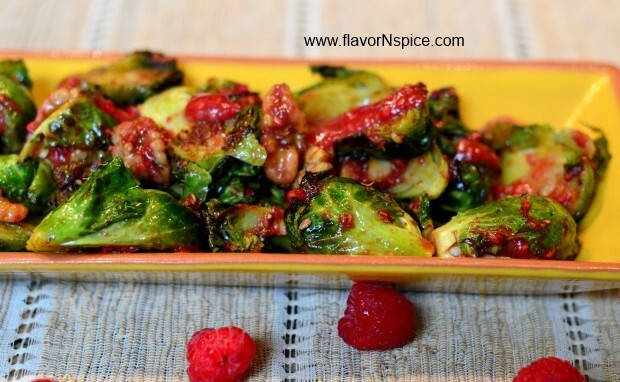 I flavored the sprouts with some curry powder, coriander powder and then dressed them with a fresh raspberry vinaigrette. The addition of walnuts gave the salad some crunch and the dish was beautiful! 1. 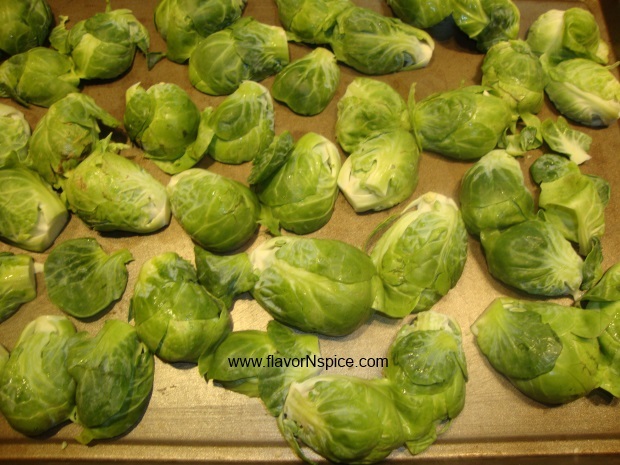 Wash and thoroughly dry the Brussels Sprouts (make sure they are absolutely dry otherwise they will not be roasted properly and instead get steamed in the oven). 2. Preheat the oven at 325F. 3. Chop off the stemmed edges of the Brussels Sprouts and then cut them in halves. 4. Pour about a tablespoon of extra virgin olive oil, salt and pepper on the cut vegetables and mix everything together. 5. Lay the Brussels sprouts on a baking sheet (cut side down) and place them in the oven for about 8-10 minutes to roast them. 6. 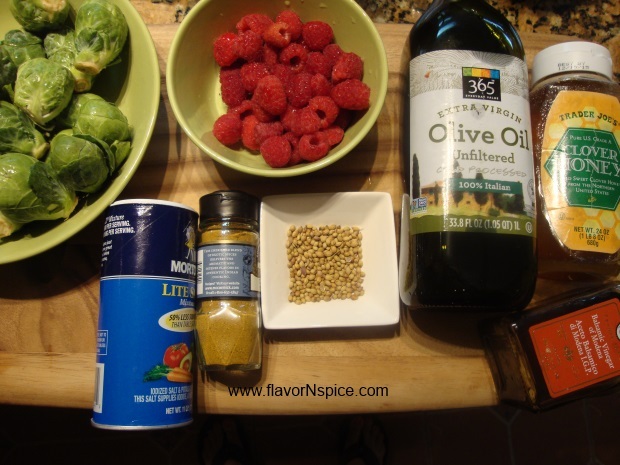 While the sprouts are roasting you can make the vinaigrette by combining (and blending) the following ingredients in a small food processor – raspberries, honey, Balsamic Vinegar, remaining amount of Extra Virgin Olive Oil. 7. 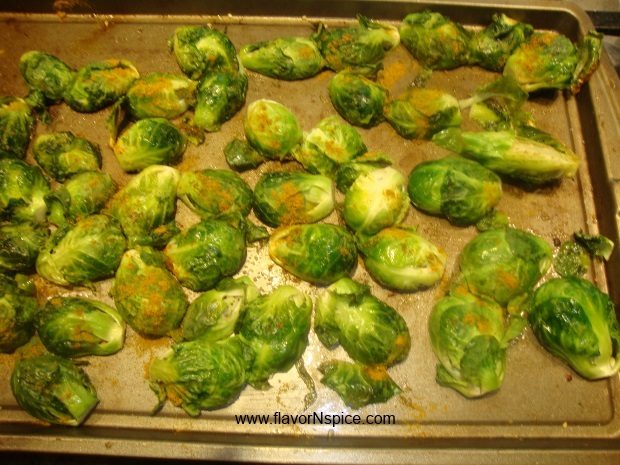 Take the Brussels sprouts out of the oven and mix in the shelled walnuts and the curry powder and then place the baking sheet back in the oven for another 4-5 minutes (make sure you don’t keep the vegetables in for too long because you can burn the walnuts or the curry powder easily). 8. 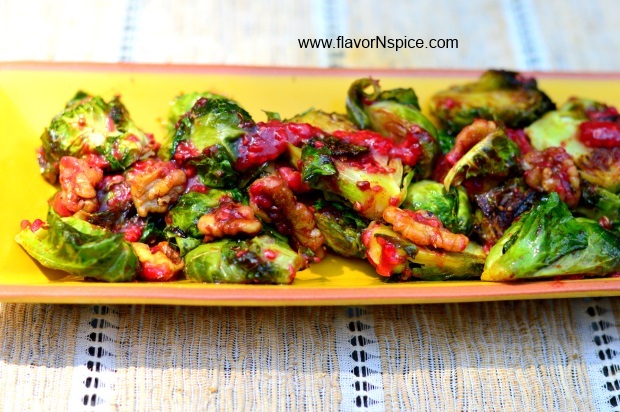 Take the baking sheet out of the oven and sprinkle the vinaigrette all over the roasted Brussels Sprouts and mix everything thoroughly. 9. Serve the dish warm or cold. You can chill the roasted Brussels Sprout salad and serve it cold as a side dish or enjoy it as a light lunch by itself. OMGEEE!!! Looks amazing! I love the flavor combinations you used!!! Thanks Mary! You are too kind 🙂 but yes, so try this recipe – it’s a great way of making veggies taste out-of-this-world good by adding a simple fruity vinaigrette!